DUBLIN CAROL is the latest play by Conor McPherson, the author of THE WEIR. The play was being held at the Old Vic since the Royal Court, where it was to have opened, is not yet ready. To simulate the intimate nature of the Royal Court, the audience sits on seats on risers on the stage of the Old Vic facing into the backstage which is fitted out as the “real” stage. In general, I would have to say that the play will suffer by comparisons with THE WEIR and be labelled “not as good”. That would be rather a pity since the playwright has moved on, as he has to, into new territory. If THE WEIR was about the importance of telling stories, DUBLIN CAROL is about the importance of listening. 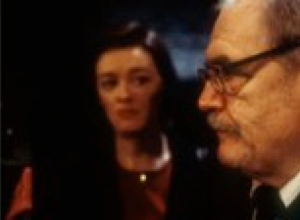 Unlike THE WEIR, which is in one continuous scene, DUBLIN CAROL is in three short scenes. Just as the characters in THE WEIR come to a new realization through the act of telling stories, so the central character of DUBLIN CAROL, the drunken undertaker John (Brian Cox), comes to a new view of himself by finally allowing himself to listen to other people, like his assistant Mark (Andrew Scott) and especially his daughter Mary (Bronagh Gallagher). The play actually suggests that a saving grace is all around us if we only stop talking about ourselves and allow ourselves to hear it. It’s a rather surprising conclusion to a play set in a funeral parlour on Christmas Eve. All three of the actors had mastered the understated, naturalistic style necessary for this kind of play. As with Pinter, we have to pay as much attention (or more) to the subtext of what the characters are saying; but where Pinter’s work has been called a “theatre of menace”, I would say on the basis of THE WEIR and DUBLIN CAROL that McPherson is writing a theatre of healing. Photo: Bronagh Gallagher and Brian Cox. ©2000 Tristram Kenton.